Essentially global warming is climate change in one direction, the warming part of the cycle. The concept is as simple as it sounds, an increase in the average temperature of the earth. Zero on this graph is the average temperature during the 30 year period from 1961-1990, a benchmark value adopted by the Intergovernmental Panel on Climate Change (IPCC). The trend is up and it represents an increase in the anomaly (deviation) from this average value. At the turn of the last century it was cooler than the 1960-1990 average and lately it has been getting warmer than this average both in specific years and the five year running average (red line on the graph) – running averages even out the variation from year to year and make it easier to visualize any trend. At this point the debate usually launches into the reasons why there is warming. Increases in CO2 emissions that enhance the greenhouse effect and that it’s all our fault for burning fossil fuels. We will resist this temptation for a moment – even to the point of not linking these words to other pages on this site that explains them in detail – for we need to take a different look at temperature data. Although direct measurement can only take us back to the 1880’s, scientists have developed ways to estimate global temperature in the distant past, especially variation in oxygen isotopes from fossils found in deep sea sediment cores and rocks. The picture for the past 5 million years based on these sediment core data, with graphic again from Robert A Rhode / Global Warming Art, looks like this. Now this is interesting because these data tell us the opposite – for the past 3.5 million years, on average the earth has been cooling compared to a relatively stable period between 3.5 and 5 million years ago. Note that the time axis is reversed in this graph. The dotted line at zero on the graph is current earth temperature as at 1950, so we could say that we have been mostly cooler in the past 2 million years than present day (hence the idea of warming) but notice that there is a lot of variation caused by cycles of warming and cooling estimated at 100,000 and 41,000 year intervals (the noise in the line). Currently we are at one of the warming peaks, similar to at least three others in the past 500,000 years. We can use our 24-hour day analogy here. If we make 5 million years equivalent to twenty-four hours, then the cycles that produce the peaks and troughs run at 30 and 12 minute intervals. In the time it takes to drink a cappuccino the earth flips from a cool trough to a warm peak. Even with analogies it is hard to perceive these time frames - hard enough to imagine back a century to the 1880’s. Go back a thousand years and we are still in recorded history, but before the magna carta, and 10,000 years sees a handful of humans about to invent agriculture. Half a million years is just too far really, surely we are guessing what went on then. The fossil record gives us an idea of what the temperature variations were like for even longer periods of time, back over 500 million years. Back then there was prolific animal and plant life in the oceans but not on land, probably because the atmosphere was not sufficiently oxygen rich to block out UV radiation. On this time-scale the present is cold compared to most of the past. 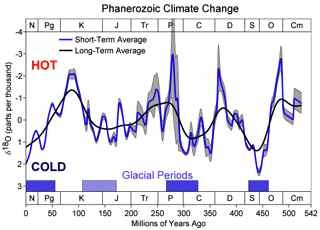 Only a period in the Paleozoic era around Silurian-Ordovician boundary was colder. Again the axis is reversed so from left to right we travel further back in time. When we look back in time the conclusion is that we are presently in an ice age, a cooler than average time in the earth’s history. It also makes it easier to see why there is so much controversy about global warming. The overall trend can be quite realistically considered warming OR cooling. The only thing you need to change is the time-frame. Also if we consider the longer-term trend then maybe a bit of global warming right now is a good thing. It will get us back closer to the long-term average. No more nasty ice age. This may be true for the grand scheme of things, although climate change at this scale is neither good nor bad, it just is. It has been cooler, although probably not much cooler and warmer in the distant past. And climate has changed. It is why the earth is as it is now. No, no, no - let’s be serious not philosophical. We know that whether it is because of wobbles in the earth’s orbit, volcanic eruptions or greenhouse gases, when the atmosphere warms up there is more energy buzzing around and there are consequences for the world weather, oceans and atmospheric conditions. It also makes no difference if the earth heats up from a cool or a warm part of the cycle, it is still global warming with consequences. This is true. Global warming effects are real and there are many. Again this is neither good nor bad unless - and this is the clincher – unless there is a dependence on a specific set of climate conditions. So this is why global warming is bad, why politicians talk of catastrophic climate change and why environmental activists around the world want something done about it. If environmental conditions change too much then nature, made up as it is of a multitude of plants, animals and microbes all doing their more making thing, will take strain. Some of these animals and plants cannot tolerate too much change in their supplies of food and water and/or available shelter, and they suffer. They have to reproduce less, move or die. And if their preferred conditions are absent for a long time relative to their life cycles or cover a wide area, their species will go extinct sometimes quietly at other times spectacularly. This is the reality of the problem for conservation. Species go extinct. New climate conditions are good for others though. Species better suited migrate in or evolve in situ. Without change as a driver evolution would be very slow and the earth would not have biodiversity to loose. Global warming is a driver of the natural dynamic of the earth and nature rides on it. 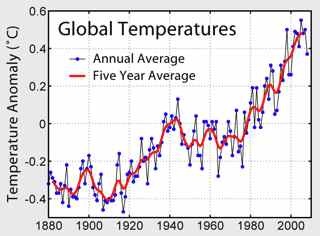 Global surface temperature increased 0.74 ± 0.18 °C (1.33 ± 0.32 °F) during the last century. The Intergovernmental Panel on Climate Change (IPCC) concludes that increasing greenhouse gas concentrations resulting from human activity such as fossil fuel burning and deforestation caused most of the observed temperature increase since the middle of the 20th century. The implication is that humans caused warming and that humans can fix it. Maybe, or more likely maybe not. Just think of the huge thermal inertia of the ocean water where the time lags and so change happens at intervals beyond our understanding – but this is not the true picture or the real challenge. The challenge is the changing conditions as they effect us for we now run the world to our beat. We are the single species that will be most affected by global warming simply because we rely so much on natural capital for food, water and a host of other goods and services. And there is not much we can do about that dependence.